#streetstyle is a feature in which your friend and ours, Hannah Beer, skips around London stopping, photographing and questioning those she deems stylish. If you have noticed an Audrey Hepburn look-alike admiring your fashion it was probably Ms. Beer. It is also worth noting that the concept of street style is unique to Prancing Through LIFE. Copyright 2013. Street style this week is a little different. Rather than spending my weekend wandering around various parts of London, like usual, I spent it trying to get as far away as possible as part of a Jailbreak. After 12 hours in a Rolls Royce cruising across Germany, we found ourselves miraculously on a train to Verona (all for free), which gave me the perfect opportunity to photograph some stylish Europeans. Christian and Beverly, 29 and 23. At the Casa di Giuletta, the backdrop of the world’s most famous lovers, you’re bound to find some couples. This couple however stood out first and foremost because of their seriously impressive trousers and then their very bold pattern clashing. Most people wouldn’t be brave enough to pair leopard print with tribal, or tartan with, well, anything, but maybe that’s why these two look so good together. Definitely the best couple we saw (and believe me, there were many). Beverly – I feel like your style is an honest representation of who you are as a person. Christian – Style is everything: your confidence, who you want to be, what’s on your mind. The first thing I notice on most men is their shoes, and so naturally I looked twice when I saw Davide’s classic Docs. A good pair of blue jeans are usually pretty hard to come by, but Davide nailed it, and who can ignore an umbrella that cheery? In England, umbrellas are so necessary that no one invests much in them (I know I buy the cheapest possible and proceed to leave them on buses), but clearly it’s a different story in Italy. 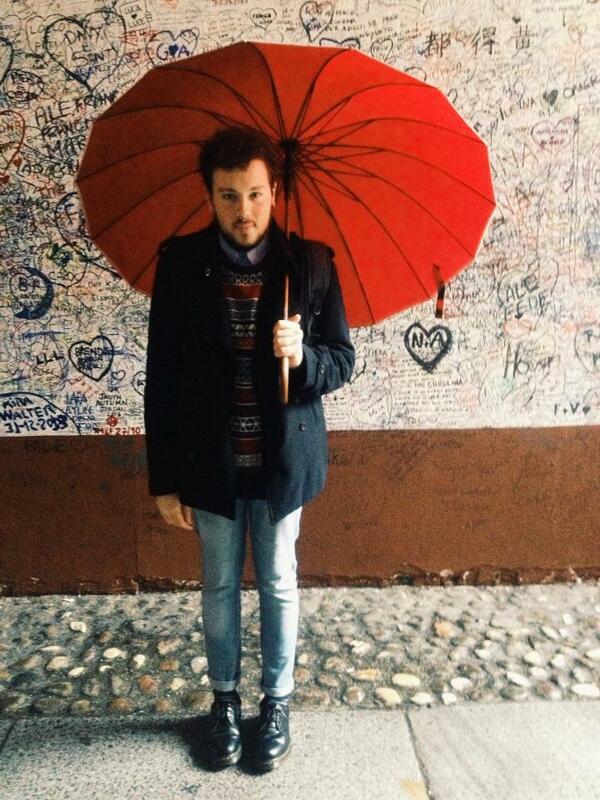 The umbrella here makes all the difference, meaning that from (over the) head to toe Davide looks great. Bravo. Being happy with who you are. Hannah Beer is a student at University College London. She studies Italian and German. In her spare time Hannah enjoys eating red velvet cupcakes and banging on about feminism. When Hannah grows up she’d like to be Audrey Hepburn – this may prove difficult but let the haters hate. Hannah looks a lot like anyway Audrey Hepburn so she’s half way there. I read this article and found it very interesting, thought it might be something for you. The article is called In Fair Verona – #streetstyle and is located at http://prancingthroughlife.com/2014/02/11/in-fair-verona-streetstyle/.